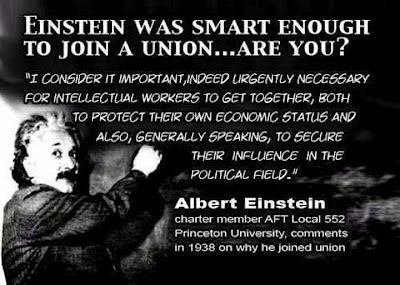 John's Labour blog: Einstein was smart enough to join a union...are you? Einstein was smart enough to join a union...are you? Need I say anymore? Come on - you know it makes sense. Hat tip various FaceBook sharers. I like this, though some of us in the public sector are in Unite. Another quote often attributed to Einstein (probably wrongly) is "Insanity is doing the same thing over and over again but expecting different results." A bit like voting for the Labour party. The clever answer is to say that by just voting and not participating in the Party - what else do you expect? I prefer what your former GS Jack Jones said in 1971, the relationship between trade unions and the Labour Party is a bit like a marriage: "Murder maybe, divorce never". That would be not long before he was one of the authors of Labour's anti-union Social Contract, or "social con-trick" as it was know; not his finest hour. Being pro-union and pro-Labour have long been different things. Shame, shame on you Gilberdyke - did you ever volunteer to face and then suffer a fascist bullet? The anonymous armchair internet warrior criticises a true working class hero. What utter contemptible cowardly filth you are. Harsh. But I'll excuse you because it's late. Those of us who have been on the left a bit longer are careful not to romanticise leaders and to recognise, in a mature way, the weaknesses in their political outlooks even where their heart's in the right place. don't try and patronise "Gilberdyke"
Cowardly scum such as you are a cancer in our movement. You are not of the "left". We don't want filth like you in it. Go off and join your soul mates in the EDL and BNP. Besmirching the memory of a great trade union leader and brigadier who was shot and badly wounded fighting the fascists. it is about time the far left public school clowns were thrown out of our movement. For too long they have made us look like a laughing stock in front of the bosses and our members with their weirdo views. They can go off and join their own union. Call it "respect" even. So first you invite "Gilberdyke" to participate more actively in Labour-party politics (implicitly criticising them in the process), and before you know it you're insulting them and saying you "don't want filth" like them involved. John actually suggested that you should not whine about something if you are not prepared to participate. When he found out that Gilberdyke had disgusting fascit views he correctly told him to go forth and mulitply. the terrible days of the social con-trick - when a government actually sat down with the trade unions and negotiated national pay rises. I’ll assume John had a bad day and was “tired and emotional”. It's worth bearing in mind that those of us who at the time opposed forced wage restraint from right-wing Labour, like Shirley Willliams and Denis “squeeze the rich till the pips squeak” Healey (both of whom could fit into today's Coalition Government) were the same people physically confronting the NF on the streets. And elsewhere - I worked in a socialist bookshop at the time and we kept weapons under the counter out of genuine fear of attack. No, of course it wasn't Ebro (for which Jones obviously deserved respect) but we did our bit. Getting back to the point – we all want to see increased union membership but it would be complacent to think that means that links with the Labour party will remain the same if the working class don’t see the benefit of that. You don't progress the argument by calling someone a neo-Nazi for saying that - you just help to prove Godwin's law. I wish I had been "tired and emotional" when reading your contemptible remarks. You are a fascist anonymous troll who has made a series of anti-immigration, pro EDF/BNP comments (a number I have had to delete) and attacking decent trade unionist on various posts and in various names. You even described Breivik as a victim of multiculturalism. You now claim to be of the “left” and (with no evidence to support it) to be some sort of anti-NF activist in the past. You are just pathetic. Er, sorry John; you've obviously got me mixed up with someone else. For one I always use Gilberdyke (why not, it's a nice username). And I think maybe my most controversial comments until now have been to suggest that Stratford have a statue of Kier Hardie (in response to your post of 12 January 2012) and that you might take your problems with Elephant Insurance to the Financial Ombudsman Service (3 July 2011)! It could start to make sense if you have confused me with someone else, but for the record I hate all fascists and fascist/racist organisations without exception and I would say I'm in favour of immigration (difficult not to be when my partner is one). Breivik? I think I would say that despite what the Norwegian courts think, I would count him as crazy. We have met, when I was a co-opted member at Newham and thought we got on fine, so I know you're a nice lad really (even if our politics don't entirely coincide). Apologies - I've done some belated checking and it looks like I am very wrong and I will have to eat a huge chunk of humble pie. Some anon comments are very interesting but I get some very strange, nasty ambiguous comments from anonymous trolls which I should just delete. I was certain that you were one of the most unpleasant and persistent ones who plays Far left/Far right games. The “Breivik was a victim too” was a final straw. Once again apologies for my language and accusations. I still don't have a clue who you are and think your politics are frankly dodgy but...it’s been a long time since anyone called me a "lad".